“The accident occurred at the Lomonosov Street near City Hospital No. 5. Three pedestrians suffered under the wheels of the fighting vehicle: A girl aged eight died on the spot, a woman and a child in a stroller were taken to hospital,” Ukraine's Interior Ministry reported Monday night. 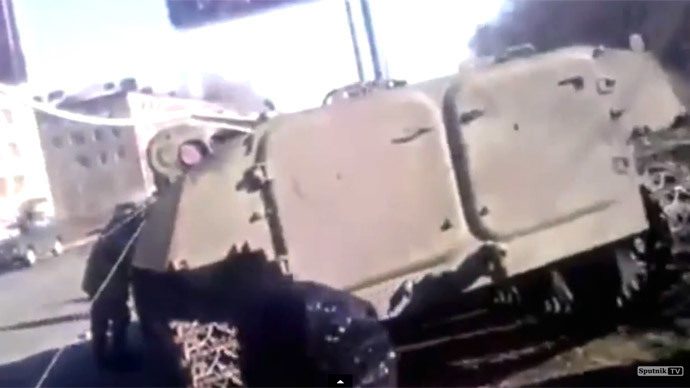 The Ukrainian soldiers responsible for the incident reportedly fled the scene in a taxi. Authorities later announced that the perpetrators were detained. “Those responsible for the accident, two soldiers, were detained and handed over to the military prosecutor,” announced Vyacheslav Abroskin, head of Donetsk Regional Police, loyal to Kiev. According to unconfirmed reports on social media, additional reinforcements were dispatched to Konstantinovka to quell the unrest. Some alleged those might include members of the radical nationalist units. Meanwhile Ukraine’s Interior Ministry announced that a task force from the General Staff of the Armed Forces was sent to lead the investigation, promising to punish those responsible. Kiev authorities also report that they have singled out the individual they believe was solely responsible for the en masse reaction against the negligence of Kiev’s forces. A Ministry of Internal Affairs spokesman for Donetsk Region, Ilya Kiva, promised that the “instigator” will soon be caught and be brought to justice. Kiva also urged Konstantinovka residents to stay calm and not to incite further violence.